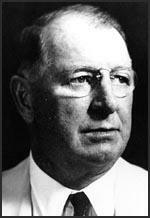 William Franklin Knox was born in Boston on 1st January 1874. His parents, who were originally from Canada, moved to Grand Rapids, where his father ran a grocery store. After graduating from Alma College he served during the Spanish-American War under Theodore Roosevelt with the Rough Riders. After the war, Knox became a newspaper reporter in Michigan. He also changed his name to "Frank Knox". In 1912 he became founding editor of New Hampshire's Manchester Leader (later merged with the New Hampshire Union Leader). Knox supported his old friend, Theodore Roosevelt, the Progressive Party in the 1912 Presidential Election. But in the 1916 Presidential Election he campaigned for Charles Evans Hughes, who represented the Republican Party. During First World War, Knox was an advocate of intervention in the conflict. In 1917 he joined the United States Army and served on the Western Front as an artillery officer in France. By the end of the war he had reached the rank of Major. After the war he returned to the newspaper business and eventually handled the business administration of newspapers owned by William Randolph Hearst. In 1930, Frank Knox became publisher and part owner of the Chicago Daily News and used his power to oppose President Franklin D. Roosevelt and the New Deal. Knox was a candidate for the nomination as Republican Party candidate in the 1936 Presidential Election, but was beaten by Alfred Landon. He agreed to be Landon's running-mate but was heavily defeated by Roosevelt and Henry Wallace. Although Knox disagreed with Roosevelt on domestic policy, he did share his views on the dangerous threat posed by Adolf Hitler and Nazi Germany. After the outbreak of the Second World War Knox argued that if Britain was defeated, the United States would be Hitler's next target. Knox stated at the time: "In public speeches I have warned the American people that if Britain is defeated, we ought then to be fully prepared to repel attempts by Germany to seize bases on this side of the Atlantic. Germany would use these bases either to attack us directly or else first to establish herself solidly in South America. Many of our people and many of the speakers who have opposed giving ample aid to Great Britain apparently believe it fantastic to think that there is any real danger of invasion. I disagree with such people and believe that a victorious Germany would move over to this hemisphere just as soon as she could accumulate the strength to do so, and certainly very soon unless we now take the steps to check her career of reckless aggression." As Joseph E. Persico, the author of Roosevelt's Secret War (2001) has pointed out: "What Knox did have in common with Roosevelt was a rejection of isolationism as illusory and an acceptance of interventionism as a necessity. On an afternoon in December 1939, FDR invited Knox to the White House for a free-ranging view of the world situation.... Before he left, FDR tested on him a plan of breathtaking boldness. He wanted the defeated 1936 Republican ticket, Landon and Knox, to come into his cabinet, filling the two military secretaryships, War and Navy.... Landon subsequently made known that he was not interested in the War Department post, fearing Roosevelt intended merely to exploit him." Knox did accept Roosevelt's proposal and in July, 1940, he became Secretary of the Navy. A fellow Republican, Henry Stimson, became Secretary of War. Jean Edward Smith, the author of FDR (2008) has argued that Roosevelt was determined to get the timing of the decision right: "It was important to stress the bipartisan nature of the defense effort, he told Knox. Even more important, if the GOP nominated an isolationist candidate, Knox and Stimson would be deemed guilty of bad sportsmanship in joining FDR's team afterward." Knox was allowed to bring in James V. Forrestal, an investment banker, as his undersecretary. Knox worked tirelessly to provide help for the British in their lone fight with Nazi Germany. Lord Lothian, the British ambassador in Washington, informed Knox on 28th July, 1940, that Britain had entered the war with 176 destroyers and that only 70 of these were still afloat. He requested 40 to 100 destroyers and 100 flying boats. Robert Jackson, the Attorney General, pointed out that at the cabinet meeting on the following day: "Knox opened the discussion by relating how Lord Lothian had pleaded with him for the destroyers on the previous evening. Knox had countered with an inquiry whether the British had ever considered selling parts of their Atlantic and Caribbean possessions. Lothian said they had not. This, so far as I know and so far as I can learn, was the first mention of the American need for bases in connection with the British need for destroyers." Knox also worked closely with William Stephenson, the head of the British Security Coordination. As Stephenson later pointed out: "The procurement of certain supplies for Britain was high on my priority list and it was the burning urgency of this requirement that made me instinctively concentrate on the single individual who could help me. I turned to Bill Donovan." Stephenson was a close friend of William Donovan who had met during the First World War. Donovan arranged a meeting with Knox, Stimson and Cordell Hull (Secretary of State). The main topic was Britain's lack of destroyers and the possibility of finding a formula for transfer of fifty "over-age" destroyers to the Royal Navy without a legal breach of U.S. neutrality legislation. In September, 1940, Japan and Germany signed the German-Japanese Pact. Allied secret services soon discovered that Joachim von Ribbentrop, the German foreign minister, had sent a telegram to Vyacheslav Molotov, the Soviet foreign minister, where he pointed out that the alliance was to be directed towards the United States and not the Soviet Union. "Its exclusive purpose is to bring the elements pressing for America's entry into the war to their senses by conclusively demonstrating to them if they enter the present struggle they will automatically have to deal with the three great powers as adversaries." Knox was now convinced that eventually that the United States would be attacked by the Axis powers. He worked closely with William Allen White, the founder of the Committee to Defend America by Aiding the Allies (CDAAA). White gave an interview to Knox's newspaper, the Chicago Daily News, where he argued: "Here is a life and death struggle for every principle we cherish in America: For freedom of speech, of religion, of the ballot and of every freedom that upholds the dignity of the human spirit... Here all the rights that common man has fought for during a thousand years are menaced... The time has come when we must throw into the scales the entire moral and economic weight of the United States on the side of the free peoples of Western Europe who are fighting the battle for a civilized way of life." Members of the CDAAA argued that by advocating American military materiel support of Britain was the best way to keep the United States out of the war in Europe. It played an important role in the proposal of the Lend-Lease Act. The proposed legislation would give President Franklin D. Roosevelt the powers to sell, transfer, exchange, lend equipment to any country to help it defend itself against the Axis powers. Knox explained in a speech on 27th January, 1941: "To keep our land secure we must prevent the establishment of strong aggressive military power in any part of the New World. We can keep non-American military power out of our hemisphere only through being able to control the seas that surround its shores. Once we lose the power to control even a part of those seas, inevitably the wars of Europe and Asia will be transferred to the Americas. We need time to build ships and to train their crews. We need time to build up our outlying bases so that we can operate our fleets as a screen for our continent. We need time to train our armies, to accumulate war stores, to gear our industry for defense. Only Great Britain and its fleet can give us that time. And they need our help to survive." Congress passed the Lend-Lease Act on 11th March, 1941. A sum of $50 billion was appropriated by Congress for Lend-Lease. The money went to 38 different countries with Britain receiving over $31 billion. The Commander in Chief of the Japanese Combined Fleet, Admiral Isoruku Yamamoto began planning for a surprise attack on the US Navy at Pearl Harbor. Yamamoto feared that he did not have the resources to win a long war against the United States. He therefore advocated a surprise attack that would destroy the US Fleet in one crushing blow. Yamamoto's plan was eventually agreed by the Japanese Imperial Staff in the autumn and the strike force under the command of Vice Admiral Chuichi Nagumo sailed from the Kurile Islands on 26th November, 1941. Richard Sorge, a German journalist working as a Soviet agent in Tokyo, discovered details of the plan for the attack on Pearl Harbor. However, this information does not seem to have been passed onto the United States. US Army intelligence. Harold Stark, Chief of Naval Operations, feared a Japanese attack on the US Fleet at Pearl Harbor but by the end of 1941 became convinced that the initial attack on the US Navy would come in the Far East. Military intelligence did intercept two cipher messages from Tokyo to Kichisaburo Normura, the Japanese Ambassador to the United States, that suggested an imminent attack, but Richmond Turner, in charge of evaluating and dissemination, did not pass on warnings of the proposed attack to Admiral Husband Kimmel. Nagumo's fleet was positioned 275 miles north of Oahu. On Sunday, 7th December, 1941, 105 high-level bombers, 135 dive-bombers and 81 fighter aircraft attacked the the US Fleet at Pearl Harbor. In their first attack the Japanese sunk the Arizona, Oklahoma, West Virginia and California. The second attack, launched 45 minutes later, hampered by smoke, created less damage. In two hours 18 warships, 188 aircraft and 2,403 servicemen were lost in the attack. Luckily, the navy's three aircraft carriers, Enterprise, Lexington and Saratoga, were all at sea at the time. The following day, President Franklin D. Roosevelt and a united US Congress declared war on Japan. Robert Jackson, the Attorney General, has argued that Knox had assured President Roosevelt that after the United States entered the war, the US Navy would "knock Japan out of the water" in no time. "When questions had arisen such as stockpiling rubber, Knox, with great assurance, had said that our naval forces in the Pacific were so superior to those of Japan that we would have a very brief interruption of our rubber supply. Of course at Pearl Harbor the losses were very serious, much more than the public realized. The naval force was very much reduced. But even so, I was surprised that we were faced with such a serious problem in the Pacific." During the Second World War Knox worked harmoniously with Admiral Ernest King. Along with Admiral Chester Nimitz and Admiral William Halsey, he helped plan Operation Vengeance that resulted in the assassination of Isoruku Yamamoto, the man responsible for Pearl Harbor. William Franklin Knox died of a heart attack on 23rd April 1944 and was replaced by James Forrestal as Secretary of the Navy. Frank Knox was a self-made multimillionaire who had risen from grocery clerk to cub reporter, eventually to publisher of the Chicago Daily News. He was a veteran of that legendary band the Rough Riders, who had charged San Juan Hill with Teddy Roosevelt. Knox, a visceral foe of the New Deal, had actually hoped to oppose Roosevelt in 1936 as the Republican presidential candidate. Instead, he had had to settle for the vice presidential nomination, going down to defeat with the head of the ticket, Alf Landon. What Knox did have in common with Roosevelt was a rejection of isolationism as illusory and an acceptance of interventionism as a necessity. On an afternoon in December 1939, FDR invited Knox to the White House for a free-ranging view of the world situation. Knox was still with the President as six o'clock approached, and FDR suggested that he stay for dinner. Afterward, they could watch the movie Drums Along the Mohawk. Knox declined, though he found himself increasingly seduced by the Roosevelt magnetism. Before he left, FDR tested on him a plan of breathtaking boldness. He wanted the defeated 1936 Republican ticket, Landon and Knox, to come into his cabinet, filling the two military secretaryships, War and Navy. Indicative of Roosevelt's sinuous style, the very day before, he had instructed his press secretary, Stephen Early, to tell reporters, "I don't think it is likely the President will put a Republican as a member of his cabinet." Landon subsequently made known that he was not interested in the War Department post, fearing Roosevelt intended merely to exploit him. FDR then turned to a quintessential establishment American. Henry Stimson was a product of Phillips Academy at Andover, where, in his day tuition was sixty dollars a year and students cut their own firewood. He went on to Yale, joined Skull and Bones, and later graduated from Harvard Law School. His roots in the country were deep. He could recall stories his great-grandmother had told him of her conversations with George Washington. Stimson had previously served as President William Howard Taft's secretary of war, Calvin Coolidge's governor general of the Philippines, and Herbert Hoover's secretary of state, in all serving every president since William McKinley in one key post or another. At seventy-three, lean, tall, with his steel gray hair and erect posture, Stimson was the soul of rectitude and enjoyed as well a reputation as an able administrator. To the grumbling of disappointed Democratic office seekers and the cries of betrayal from fellow Republicans, Stimson and Knox were enlisted in FDR's coalition cabinet just before the Republican convention, the former as secretary of war, the latter as secretary of the Navy. Admiral General Raeder, chief of the German Navy, recently made a speech to the shipyard workers in Bremen. The significant portion of his speech to the United States was a promise that after the war Germany would have - I quote -: "A fleet developed and enlarged to a size befitting a world power, and overseas naval bases where there would be plenty of work of all kinds." There can be little doubt as to German ambitions for world sea power in the event of victory. The existence of the British Navy and a balance of power in Europe have operated to give us military security against aggressions from that region. For many years we actually have had the benefits of a two-ocean Navy instead of only the one-ocean Navy that flies the American flag. The defeat of Great Britain would definitely carry with it the destruction of the British Fleet or would transfer it to German hands to be used against us when Germany has trainee German naval personnel to operate it.